It’s a string of umbrella pines stretching across a small hill to our right. These trees. These trees have been part of me my whole life. I don’t know why I say that. They’re not indigenous to Western New York or even America. They are native to Mediterranean climes. Vague memories stir within the oldest parts of my brain. I faintly recall a home movie – perhaps from my grandfather? – shot through a window of a moving car, showing this exact scene. It’s odd. I don’t know if it’s true, but it feels so,… so familiar. Maybe I’m just remembering again the first impressions I had upon arriving to Italy in 1987. We arrive at our hotel after about a thirty minute drive from the airport. It’s the Grand Fleming and it’s located inconveniently on P.Za. M. Leone Spleto, 20. The hotel is not very impressive from the outside but pleasant from the inside – despite the ongoing renovations. However, it is disappointing to discover the hotel is located far from the city center. This means we can’t walk to any of the attractions. Vouchers? We don’t need no stinking vouchers! Yes we do, and where are they? In those blue Cosmos books – the same ones Cesidia said we didn’t need to bring. Good thing she conceded the point before we left home! Peter and I get to our room and I immediately try my cell phone. It doesn’t work. I try everything. It still doesn’t work. Worse, despite being turned off, it appears the phone turned itself on at some point and the battery is partial drained. I am not very happy with Verizon. Desperate to make the contacts I need to make, I break down and use the hotel phone to call Jane, Linda, Gaetano and Michele. Jane’s not there so I leave a message. Linda is there, but Gaetano answers. This represents a small problem. Gaetano speaks no English and I can’t speak Italian. Eventually, he recognizes I’m calling for Linda and puts her on the phone. She keeps referring to me as having recently seen my parents. I’m thinking she thinks I’m one of Aunt Jean’s kids. I tell her I’m Pat & Lena’s son, but I don’t know if she understands – the phone connection is pretty bad. She then tells me she’s staying with her nephew – Gaetano – in Bazzano, not San Pio, because the earthquake has damaged her home too much. She also says many of the roads are still closed because of the earthquake and that she’ll explain it all later when she sees me tomorrow. She says just give her a call when we get to Bazzano. I hang up, more hoping than knowing what I’m doing tomorrow. I double check my driving instructions to Fontecchio and confirm Bazzano is on the way. As confusing as Linda was, Michele, the driver Jane hooked me up with, confidently accepts taking the detour to Bazzano. He also sounds like he’s done this before. I feel much better. While on the phone, I remember Jane was supposed to call me back on that line since my cell phone wasn’t working. I call her back. 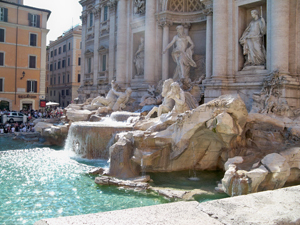 She suggests we take a cab to the Trevi Fountain where she’ll meet us. I note it might be crowded. She agrees and says to me her at the currency exchange. She doesn’t know the name of it, but says it should be obvious when we get there. I go downstairs and have the hotel hire us a five passenger cab to drive by the Spanish Steps before dropping us off at the Trevi Fountain. 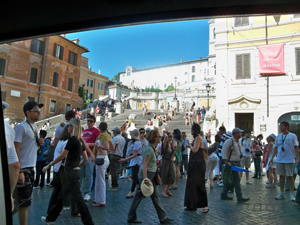 I never understood the importance of the Spanish Steps. They’re pink. They’re steps. I’m pretty sure they’re not Spanish. I do know the British poet John “Ode to a Grecian Urn” Keats spent his last few months dying of tuberculosis in a villa next to the Spanish Steps. I walked to them in 1987, so I figure it’s probably important to have the kids see them. A smallish cab stops by the hotel entrance. It doesn’t look any bigger than the four passenger cabs, but the hack appears confident. He motions us into the car as he’s moving papers on the front seat next to him. Once he clears the papers, he reaches to the part of the seat closest to the dash, appears to press a button and – presto! – up pops the back of the middle seat. Viola! We now have a five passenger cab. Cesidia, being the smallest, immediately volunteers to occupy this new seat. We drive by and all of the sudden I’m glad we’re driving by and not stopping. The place is packed. I hate packed places. I’m pretty sure the kids aren’t impressed. I know Betsy was never impressed with them. Catarina doesn’t see what the big deal is. After taking the obligatory pictures, we slowly drive through the crowd and head to the Trevi Fountain. The cab deposits us by the Fountain. It’s crowded, but less crowded than the Spanish Steps. It’s also hot, but the splashing sound of the Fountain’s crystal clear water somehow cools us down. Not really. We make a bee-line for some shade. We do not immediately see a currency exchange, but we’re torn between finding that and going down to the fountain. We see an opening and head for the fountain to get some pictures. We sneak closer and I remember the reproachful loose change given to me by the Buffalo Euro dealer and the Canadian border guard. I fish the cursed coins out of my pocket. They’re small. That’s good. There’s enough for everybody. That’s even better. Now all of the sudden I’m thankful I got them. We all toss a total of five coins into the Fountain. Then it’s back to searching for the elusive currency exchange. We we’re supposed to meet Jane at 5pm. It’s a little after 5pm now. Betsy finally finds a currency exchange deep within one of the many alleys heading out of the square. We stay there for ten minutes. No Jane. I venture back to the square and discover another currency exchange – this one right across from the fountain. Who knew there’d be two currency exchanges? I go back and get everyone else and we return and wait. It’s twenty after 5pm. No Jane. Finally, Jane finds us. She immediately tries to fix my cell phone, but to no avail. We start heading towards the Pantheon. 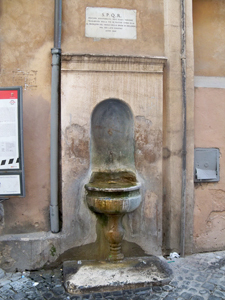 On the way, Peter finds a public fountain. Without hesitation – and before I can intervene – he drinks the water. I roll my eyes. He doesn’t drop dead, so I figure the water can’t be that poisonous. 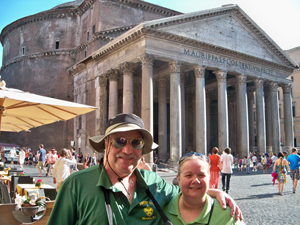 We reach the Pantheon only to find it’s closed until 6pm. It turns out today’s Saturday and the Pantheon is still an active church. Mass is going on and we’ll have to wait until the end of Mass to enter. 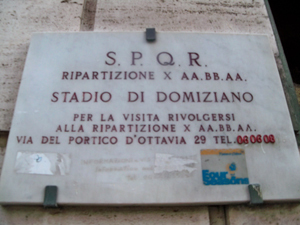 In the meantime we take a detour to try to find the pensione I stayed at in 1987. I’m pretty sure I remember the right side street (there aren’t too many) but, alas, it is not there. Next we walk to the left of the Pantheon in an attempt to find the hole-in-the-wall bar that offered Pepsi on tap in 1987. Again, no luck. This time, though, I’m less sure which side street is the correct one. As unlucky I am in retracing past steps, Betsy’s hotel – the Minerva – remains active. That’s where she stayed in 1975. Here’s the weird twist. In the plaza outside is an obelisk with an elephant on it. Cesidia gets lots of pictures of it. On one side of the square is the church of Santa Maria Sopra Minerva. 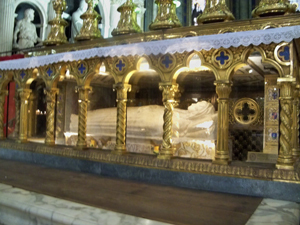 The church has the remains of St. Catherine of Siena in it (well, everything except for her head and maybe her foot). It turns out St. Catherine lived in Rome on one of the nearby streets. How’s that for a coincidence? We sneak into the church, take our requisite pictures and escape before Mass starts. Jane shows us a favorite gelato place around the corner. We have some. Everyone likes it except for Cesidia. We figure the Mass in the Pantheon is over and everyone has gone in peace, so we decide to go inspect the relic. Us and about a thousand of our best friends. Everyone’s been waiting for the Mass to end and now we all decide to enter the huge structure at the same time. 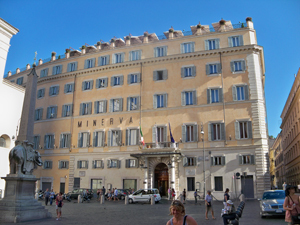 In 1987, when we were staying right next to the Piazza de Panteone, we could visit the place anytime. We waited for all the tourists to leave, so we pretty much got the run of the place. Tonight’s a Saturday night and the place is teeming. I video our quick in and out and guard the contents of my pockets. 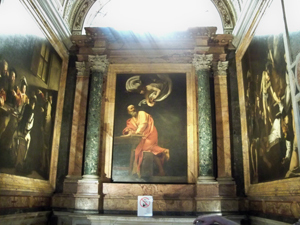 On our way to Piazza Navona Jane leads us to a church that features Baroque paintings. The kids seemed interested – for a little bit. I get to sit down while they snap more digital memories. We zig and zag through some construction and enter the Piazza Navona from the north end. 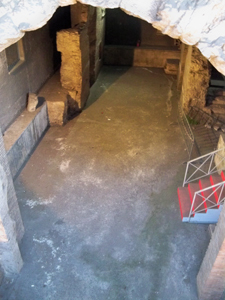 The Piazza, on the site of the former (circa 86 AD) 15,000 seat U-shaped stadium of Emperor Domitian has for nearly two centuries been, as Peter calls it, the “Circus” of the Bread and Circus of Rome. To this day, people come to be amused, to be fed overpriced meals and to get ripped off by sleazy merchants. Oh yes, and there’s clowns, mimes and artists as well as singers, dancers and other entertainers. All in all, it’s the perfect place to go as a diversion from life’s realities. Like Peter said earlier, the Piazza Navona is more about the circus than the bread. We duck down an alley across from the Fountain of the Four Rivers in search of the Penn State Bar. My niece Teresa had said it was owned by a Canadian and it was decorated with Buffalo sports paraphernalia. We find it, but it has nothing of Buffalo – almost every other sports town, including colleges, but no Buffalo. We ask the bartender about it. He says the owner traded the only Buffalo pennant – one of the Sabres – in February. 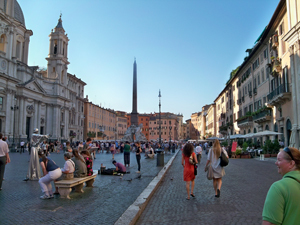 Disappointed, we return to the Piazza Navona. The kids enjoy it. Peter takes his pictures of the fountains. They all watch the performers. Jane and I walk ahead and talk business. 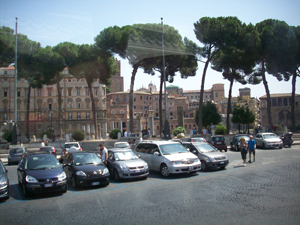 We find a cab stand next to the old ruin of Domitian’s Coliseum. It’s amazing how much lower the ground level was back then. The cab brings us back to the hotel. It’s not too late, maybe 11pm, but we’ve been us since before our flight. We’re all tired so we go to bed. Tomorrow is going to be a big day.